The independent worship band from Southern California, Lovelite, have been operating for quite awhile, releasing three full length albums. But it is the last one, 'In Three Persons', which has attracted national, and even international, attention, UCB giving it some airplay in the UK. Certainly, their sound is an intriguing one, NewReleaseTuesday calling Lovelite's approach "a blend of retro and modern: part '80s new wave, part Euro pop and indie rock" while JesusFreakHideout called 'In Three Persons' "an album any fan of worship music and indie pop should have in their collection." The group consist of Andrew Polfer (vocals, guitar), his wife Jen Polfer (vocals, keyboard), Brandon Burr (bass) and Jonathan Hall (guitar). Recently broadcaster Mike Rimmer spoke to Jen and Andrew about their ministry. Both Jen's parents were worship leaders. She said, "I spent a lot of my time hanging around church while my parents played worship. I grew up listening to Christian music although the first album I bought was the Cranberries. So that singer definitely influenced me in my start. Also I really enjoyed some Christian artists like Jennifer Knapp in the '90s; I listened in to True Rock which was a Californian radio rock station. In the '90s that is the style I based myself upon and I took that style into my youth worship group." Jen met Andrew when she was still at junior school. "We started off as friends playing music together and the romance budded from there. I really enjoyed his personality first off. Our first conversation was talking about guitars, music and worship. We actually met for a conference called True Love Waits geared towards young people who were saving themselves for marriage and that's how we met so that was perfect. He really has a good sense of humour, really funny. I love being around his quirkiness." After getting married Andrew and Jen began writing songs and performing together. Jen remembered, "Originally we used to do a lot of folk style music, they were not necessarily worship songs but they did have Christian-style themes. After driving back from a venue we both said we had a really good time but what we really enjoyed the most was worship music. We prefer the vein of the music where the lyrics are vertical rather than horizontal. We figured that we love music that is from our heart and directed straight to God. Andrew was at college at the time when we wrote our first worship song together. The worship leader from the Christian college at Azusa South Pacific University started playing the song in chapel and people caught onto it straight away. It was such an exciting and moving moment, we got together with some friends and started producing songs from Andrew's arrangements. I don't think we sat down and said let's call this band Lovelite, it just came into being. The name came from the book of Ephesians where the passage talks about you were once darkness, but now you are children of light. . . And walk in love. We had to rearrange and change the spelling in order to come up with Lovelite." 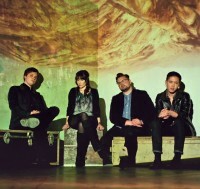 In 2007 Lovelite released a self-titled five-song EP which they described as a "collection of original worship songs written in reverence to God." The following year Lovelite released 'All Color' which one reviewer described as "in the vein of Keane and Coldplay." 'All Color' came to the attention of Chad Johnson of Come&Live! Records. As Andrew explained on the cmrcarablogspot, "Chad still worked as an A&R guy for Tooth&Nail and we thought that he was going to talk to us about joining that label. But instead he offered us to join in an incredible call to a new type of Christian label, one that offers free music and more importantly offers the opportunity to 'live simply and give generously'." The resulting album, released by Come&Live! in 2010, was 'Nearness'. It had less stereotypical musical influences. Explained Andrew at the time, "Musically speaking we really enjoy Doves, Elbow, Sleeping At Last and Peter Gabriel. Lyrically we love the poetry in old hymns and that usually challenges us. Almost as a lofty hope of creating new liturgy." In 2011 Lovelite began working on songs which focussed on the triune nature of God. Three EPs were released, 'The Faithful Father', 'His Beloved Son' and 'Our Holy Ghost'. The tracks on these came together on a full length project, 'In Three Persons'. In an interview with NewReleaseTuesday Andrew spoke about the ambitious project. "When we released the first three EPs, we have them just in their categories and their respective person of the trinity, but on the album we wanted them to be connected. So a lot of the songs flow into one another even though one is about Jesus, the next one is about the Holy Spirit. We wanted them to flow in a similar way to the way our trinity works together. It's such a mystery to us and we're in that process of trying to understand it ourselves. So it was a very rewarding experience." The most popular song on their album has been "Heart Starts Beating". Said Andrew, "We have been staying at a camp for the past two years so this was directed towards high schools. We really just wanted an energetic song that was a collaboration of what God has done and that amazing idea was around the death of Christ which brings us to life and outside the Church that very interesting idea doesn't make a lot of sense. One of the best truths of our faith is that sacrifice brought us to a point where we can celebrate and where we can have freedom. 'Heart Starts Beating' seems to be catching on and is doing well as far as gaining listeners. It is a lot of fun to play inside the Church when we lead it in our worship service. The band love playing it and love singing it within the Church." Another outstanding track on the album is the hymnlike "Strength Of The Father's Love". Said Jen, "That was a difficult one in the studio for me just because I actually had to record that one about four different times, four different days just because of technical problems or we just didn't really care for the way the take had come out. By the time I finally got that last take, it was right before we were sending it to Mick and I was so - just to be totally honest - at my wits end trying to get a really great take on that song. So by the time I did it, I really, really meant those words and just felt sustained by the Father's love knowing that it never lets me go even in those times where you've just kind of had it. That song actually is really special to me just because of the way we had to wrestle with it for such a long time. In great tragedy the strength of the Father's love holds us tight as well as in minor irritations. I love that our God cares about those moments and cares about us in a deeper way than we fully comprehend." Lovelite have been much praised for their imaginative approach to modern worship music and their clever absorption of different musical styles. Andrew spoke about their particular approach. "You can water down lemonade so that it becomes a watery form of water and sugar. For analogy sake that source of mixture is the purest and strongest form. Our hope is to take these influences that are often subconscious and by putting them together this will make a unique expression. Lovelite are not sitting there in the studio saying 'here is a Tears For Fears or Shakers sound, let's create it right here for the next song'. When in the studio we say to ourselves, 'where does this song need to go?' For us as artists, hopefully, it's honest. We do not want to be puppets or just mimicking what others have done before us. However it is hard not to let those aspects show and shine because they have become a part of us."